How do you keep your iPhone video smooth, steady, and professional? With a stabilizer and tripod! Whether you're shooting a party or going for viral video gold, you'll want to keep your iPhone as steady as possible. That's something that's not always possible with handheld video. That's why having a stabilizer or a tripod for your iPhone is so important – you can keeping shots even and smooth, so whether you're panning, tilting, just trying to keep steady, your iPhone's video stays flawless. The World's First Universal Video Rig-Sevenoak MicRig video and audio grip is designed to work with DSLRs, Camcorders, Gopros and Smartphones to create high quality video recordings. 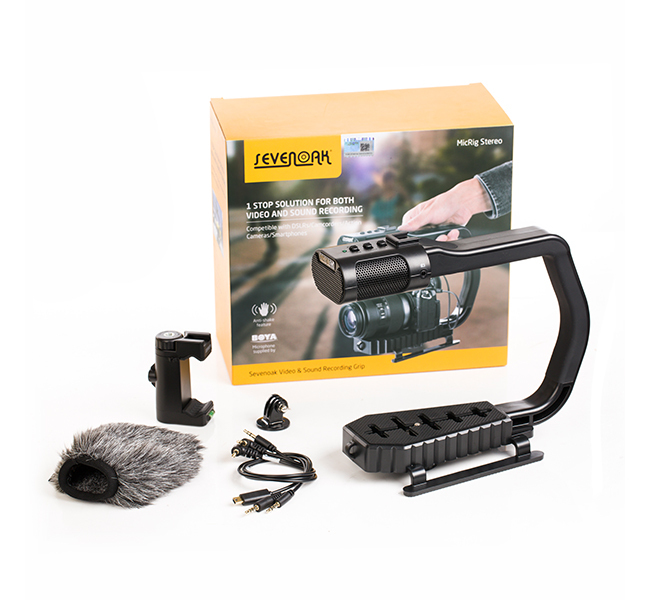 Unlike traditional, heavy, video handles and recording equipments,this grip combines both audio and video functions for less than half the weight, effectively relieving fatigue-especially on long shoots. The MicRig combines a built-in stereo microphone, which provides high-quality audio pick-up while shooting, with the versatility of a low-angle grip and top-mounted, universal cold shoe for attaching accessories like LED lights and LCD monitors. This Box includes three audio output cables for connecting your Gopro, Smartphone or DSLR Camera. The Sevenoak SK-PL30 video lights id designed for smartphone, handheld grip, dslr camera and camcorder. It features a charging indicator, cold shoe mount, brightness adjusting buttom and Power switch and a Micro USB charge port. It can be mounted to any handheld grip, dslr camera, camcorder that own a standard shoe mount. Great tool for Selfie with Smartphones by adding the hand grip such as Sevenaok SK-PSC1(sold separately).